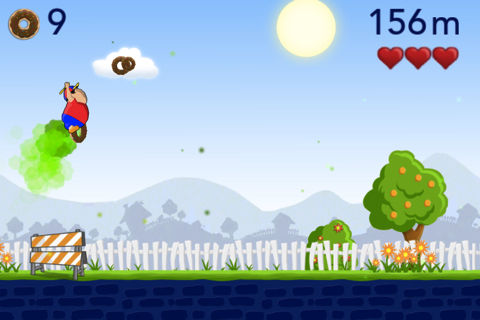 Fat Runner is a fun platformer app for the iPhone and iPod touch developed by Limpid Logic. The premise of the Fat Runner game revolves around a fat kid who discovers the outdoor portable restroom is out of order. He must then run to find another bathroom. Fat Runner is free (for a limited time) to download and play. The fat kid in the Fat Runner app automatically runs when the game starts. Your job is to tap the screen to make him jump over the obstacles and collect the donuts. In many regards it is similar to the popular Mario Bros arcade by Nintendo. There are random holes in the landscape that if you fall in you must start over. You must jump over these holes as well as the obstacles in Fat Runner (fire hydrants, thorny bushes and road closed signs). You get three hearts at the beginning of Fat Runner. Running into an obstacle removes a heart. When you hit three obstacles gameplay is over. Every time the kid jumps over an obstacle a noxious green gas comes out of his rear. You also hear a farting sound when this happens. It is clever the first time you see it. It gets old after awhile of playing. While playing Fat Runner for this review, I discovered there aren’t multiple levels of gameplay. There is only one level that does not appear to end. The farther you get into the level the faster the kid runs, the more obstacles you encounter but the app itself does not end or come to a conclusion. The main menu screen shows your highest score, a button to “Start Running” and the leaderboards for high scorers. After you finish a gameplay it takes you to a screen that shows your doughnut count, high score, highest score and a button to play again. Fat Runner is an average iOS game. It’s entertaining enough thanks to its crude humor. Because there are no ways to advance in levels, it does get repetitive after awhile. It is challenging in gameplay especially the farther you get as your kid runs faster. However, with no conclusion to the game, it is easy to give up and find another application to play. Fat Runner is a good game considering it is free to download for a limited time. I would recommend it as an easy way to pass time. I would not recommend Fat Runner if it becomes a paid for application. It needs more updates and levels to merit a fee. AppSafari review of Fat Runner was written by Darius Reimm on April 3rd, 2012 and categorized under App Store, Games, Platformer. Page viewed 3999 times, 2 so far today. Need help on using these apps? Please read the Help Page.